There is controversy concerning whether the type of radio waves emitted by smart meters can be harmful to human health. The industry will argue that the meters are safe because the frequency of radiation is low enough to be called “non-ionizing” and the intensity of the electromagnetic radiation emitted is well below the maximum exposure standards set by the Federal Communications Commission (FCC) for this type of energy. 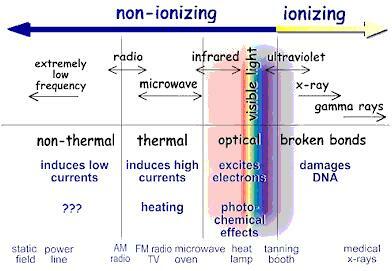 “Non-ionizing” means the frequency of energy is that of visible light or frequencies less than visible light, which would include infrared, radio waves and microwave energy. There is a major flaw in this argument however because the FCC standard is for acute exposure only (intense short term exposure) that might be encountered in industrial situations, and their standard was never developed or tested for chronic (long term exposure). Their standard was developed around the kind of short term exposures that might be encountered in industrial situations. The FCC has no standard of what is acceptable for chronic exposure to non-ionizing radio energy. The FCC will admit that higher frequency radiation, called “ionizing radiation” can separate electrons from atoms and can therefore damage human DNA depending on the intensity and duration of exposure. This is radiation that is generally higher in frequency than ultraviolet light. X-rays are an example. The FCC has taken the position that the lower frequency “non-ionizing” radiation cannot damage DNA and therefore is harmful only if it is intense enough to cause heating of human skin or tissues. The microwave oven uses this kind of energy to cook food, but the intensity of energy inside the microwave oven that produces this heating effect is far greater than would be encountered from radio transmissions, cell phones or WiFi networks. Above chart is excerpted from Wikipedia article on this subject. The FCC has developed a standard, based on industrial experience, as to what intensity of non-ionizing radiation would be intense enough to heat human skin. Anything less than that they believe is harmless. The utility companies are required to test their meters against this standard. They say they are in compliance. But the tests are always run on single meters in laboratory situations. No attempt is made to measure the cumulative exposure to a human being in a home situation from all sources, or to take account of possible exposure to multiple meters, or to take account of how energy can be intensified by reflection off metallic surfaces in a typical kitchen. But the controversy goes deeper than this. Most medical experts and scientists who are independent of the utility industry and not working for the govenment have published papers indicating that non-ionizing radiation can excite electrons and play havoc with various human systems – particularly the nervous system – leading to symptoms of mental confusion, headaches, sleep disturbances and the like. They have seen these effects at intensity levels far below the maximums set by the FCC. Industry experts will criticize such findings as based on purely “anecdotal evidence” rather than double-blind studies. But a lot of people are getting sick when exposed long term to the kind of radiation levels the FCC considers harmless. We may conclude that there is no definitive proof as yet according to the most rigorous scientific standards. But by the time we have the double-blind studies the scientists would like it may be too late for many people. Therefore we come to the “precautionary principle”. We believe it is important, where all the evidence is not in, to err on the side of caution. We see a parallel to the controversy that went on for decades concerning the cancerous effects of cigarette smoking. The tobacco industry brushed off all evidence that could be labeled “anecdotal” and continued selling their products and making people sick – until it finally was proven decades later that cigarettes do cause cancer. We also come to the principle of voluntary choice. Individual human beings should be able to make choices about what risks they want to run when the science is inconclusive. I am curious as to weather there is a class action suit pending against DTE about these Smart devices. My wife and I both have medical issues that can be and seem to be effected from these units from what I have read. Please let me know if there is a group for the State of Michigan or Oakland County in Michigan I can contact to become a part of this group. Thanks!! Michael, Our group is called Michigan Stop Smart Meters. We have not started a class action suit as yet, but are involved in two regulatory proceedings and plan to start a multi-plaintiff lawsuit next summer. We are fundraising for both the planned lawsuit and anticipated need to appeal the regulatory decisions. We could use your help! Please email me for further details: fdshel@yahoo.com. A phone number would be helpful and what county you live in. I would be interested in learning more about the planned class action lawsuit. A smart meter was installed on our home PRIOR to our receiving notice regarding it’s installation and the OPT OUT process. I DO NOT want this smart meter on our home. I am EXTREMELY concerned about the possible health risks involved. I believe the right belongs to me to to decide if I want to incur the risks without someone else deciding for me. Additionally, I consider it an invasion of privacy, tresspass, and unnecessary tampering of property.